"On a bad day Quincy Jones does more than most people do in a lifetime. On a bad day." From his beginnings on the south side of Chicago to his now record twenty-six Grammy wins, Quincy Jones is a fitting individual for a feature in the American Masters documentary series, because he is indded just that—an American Master. Originally seen on PBS, Quincy Jones: In the Pocket is an intimate look at the life of a true show business legend. Released in conjunction with the celebration of Jones' fiftieth year in the music business as well as the release of his autobiography, Quincy Jones: In the Pocket is the best way to learn more about the life of this successful entrepreneur. 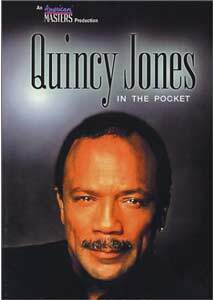 Quincy Jones: In the Pocket covers the entire span of Jones' life from his birth in Chicago in 1933 to his move to Seattle where he was first introduced to the piano (while breaking into a building). Jones would then go on to become an eager apprentice and accompanist to great musical acts such as Lionel Hampton. Jones then moved to New York where, by the start of the 1950s, he was composing and recording for artists including Ray Charles and Duke Ellington. Soon, Jones was on his own, making a name for himself as a producer and recording artist and triumphed by becoming the youngest VP at Mercury Records. Motion pictures came calling, and Jones would compose the scores to over twenty-ive Hollywood films, as well as producing such critical favorites as The Color Purple. For a life that is filled with numerous achievements both personal and professional, perhaps the greatest is the admiration that so many prominent people hold for him. Throughout Quincy Jones: In the Pocket, people such as former President Bill Clinton, Oprah Winfrey, Bill Cosby and many others praise Jones for his body of work and effort towards the greater good of society. Nearly every aspect of Jones' humanitarian deeds is covered, including his dedication to reduce third world debt as well as his meetings with the Pope. While this would be enough for anyone wishing to learn more about Jones, this documentary also goes amazingly in-depth in terms of information about Jones' life. I walked away from my viewing with a new appreciation of Jones' work as well as his struggles—including a brain aneurysm, a nervous collapse and two failed marriages. I admire the filmmakers for showing so many aspect of Jones' life, as several other documentaries about living legends often focus only on the positive and entertaining aspects of a performer's biography. Image Transfer Review: Presented in an anamorphic 1.78:1 widescreen ratio, Quincy Jones: In the Pocket offers a muted visual palette, though what is presented often looks great. Colors are rendered well; the tans and browns that decorate several of the interview sequences look nice, but the best use of color occurs when Jones is interviewed for the first time and his light-colored suit and rose-hued sunglasses come off amazingly rich and well defined. Sharpness and detail are high quality, while I noticed no edge enhancement at any time throughout. Audio Transfer Review: The Dolby Digital 5.1 mix offered here is largely dialogue-based, though the subtle jazz score does come across nicely in the surround speakers. Dialogue is consistently clear; I noticed that the Dolby Surround track offers a better center channel mix than the Dolby Digital 5.1 mix—the center channel on the 5.1 mix sounds echoed and is not mixed well with the other speakers. Extras Review: A filmography and discography are offered for Quincy Jones. I walked away from Quincy Jones: In the Pocket more knowledgeable about the man while also having a newfound respect for his music. The documentary does a great job of imparting information, which is enough for fans of Jones to rush out and grab this disc.